Nomads Hotel & Hostel Jordan is the very first Social Hotel/Hostel you'll find in Amman, located in the heart cultural center of Amman. It's a destination in its own right and a great place to socialist, and reflect on your experiences of the day. Head to the terrace and chill out areas to get yourself a well-deserved drink or two. It's a lively, friendly and unmissable. We've also got great beds for sleepy heads and of course you'll be enjoying Amman life in the most authentic surroundings. It's the ideal spot to enjoy Amman, everything you need to see is minutes away by walking. You just have to decide where to start and we can help you with that. When you have seen and done it all for the day head back to Nomads and unwind. Our goal is to help creating the perfect travel experience for our guests, Pass by the help desk to book your adventure in Jordan, from hiking, canyoning, camping, biking, site seeing and more. Choose from a great selection of rooms, from Dorms, to Quads, to Private rooms with innovative mod cons. Fast and free Wi-Fi is all yours too. To get the most out of your stay visit the travel shop and our city experts will help you. * Cancellation policy: 72 hours before arrival. Check in starts at 15:00 and late check in is possible as receptions is opened 24/7. *Payments accepted at the hostel: Cash, Credit Cards and Debit Cards. *This property may pre-authorise your card before arrival. - City Taxes - 16%. - Service Tax - 10%. 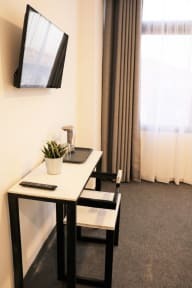 - Breakfast isn't included with the price for the dorms but only for the private rooms (check the price at the reception). Great Hostel. The staff go out of their way to help you out. They arranged taxis and let me stay until late the next day while waiting for a flight. Close proximity to rainbow st. Awesome! Every room has its own bathroom. It has an elevator! Would definitely stay again. Nomads hostel was incredibly welcoming, they’re 24hr check was great as we arrived into Amman quite late. The rooms are clean with decent sized locker that can easily fit a 50L backpack. The owners and staff were all welcoming and friendly, and the location is ideal for rainbow street. Perfekt Hostel. Had a nice time there. This place is amazing! It’s perfect in almost every way: great location, very comfortable and spacious, the cleanest hostel I’ve ever stayed at by far (and I’ve been traveling for 7 months). Of course the best part is the very friendly and super helpful staff! Do not have one complainant, I stayed here twice and loved it every time. 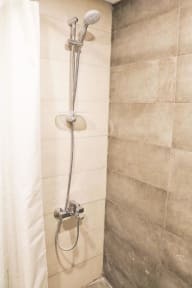 Normally I do not write reviews - but this stay at Nomads Hostel was just so exceptionally good, that I have to :D Rooms: The beds have curtains, the bathroom is big, clean and reminds me of a 4-star hotel, the lockers are big and easy to handle. Breakfast: For 3.50JD you get yummy Zataar which filled me till the evening - and I need a lot of food! Location: Just 2min from Rainbow Street and a 10min walk to the old town, couldn't be better! Staff: The most friendly, caring, helpful and fun! Super nice hostel. Very friendly staff. Stayed in a twin room and was very comfortable. Showers were nice and hot and bathroom was very clean. Roof terrace was a nice surprise with great views. Nice vibes on the roof at night. Nice and quiet in the room at night too. Would recommend to anybody in Amman.